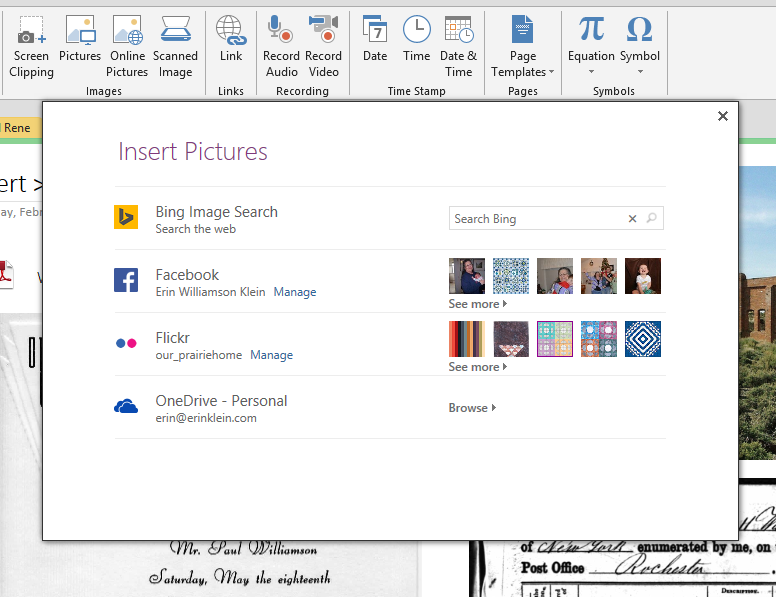 Inserting files and images into OneNote is different than attaching files in OneNote. 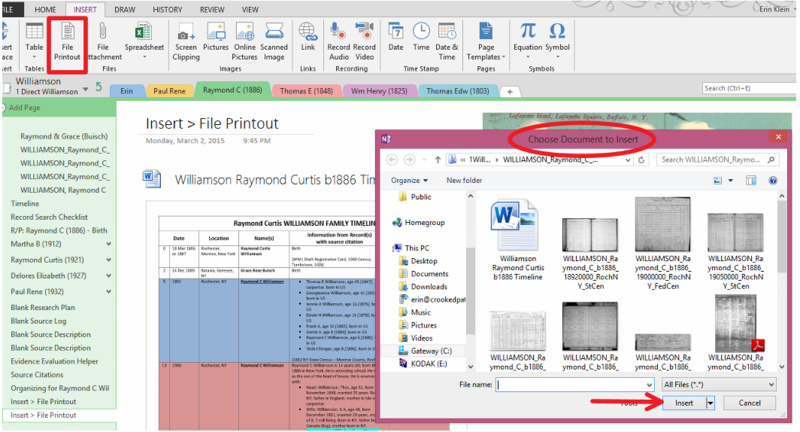 When you attach a file, you are linking from another source to a OneNote Page. It is link to a web page, link to file on your hard drive or link to another Notebook, Section or Page, for instance. The problem with attaching is when the source gets moved or disappears, your link may become invalid. When you insert a file or image, it becomes part of the OneNote page regardless of where the source of the file or image is/was. The nicest thing about inserting a file or image is that it is actually there for you to “see”, making it much more useful for research planning, transcribing, data analysis, using the drawing tools to make notes on the image, etc. From the Insert Ribbon > Choose File Printout and navigate to the folder where your images are stored. Choose the file in your folder > Click Insert. The file will be inserted onto the page with a shortcut icon that links to the original file. (You can delete those.) The images can be resized and moved around the page. Insert Pictures works the same way as File Printout except that it defaults to looking in the Pictures Folder on your hard drive. One thing to note here is the Insert > Online Pictures option. You can insert pictures from searches on the web, your Facebook and Flickr accounts, (you will be asked to sign in to your accounts before they will be linked) and your OneDrive account. For me, a much simpler technique is to Drag and Drop the files and images onto the page. Use Windows Explorer to navigate the the folder where your images are kept. If you drag and drop an image, you don’t get the shortcut icon. When you drag and drop a PDF or Word Doc, you will be asked if you want to Attach File or Insert Printout. Choose Insert Printout if you want to “see” your file on the Page. (You will get the “link” icon for Word Docs and PDFs, but again, you can delete them.) If the image is in another Notebook, Section or Page, you can copy and paste the image to the new location or create a link to the image file at the new location. 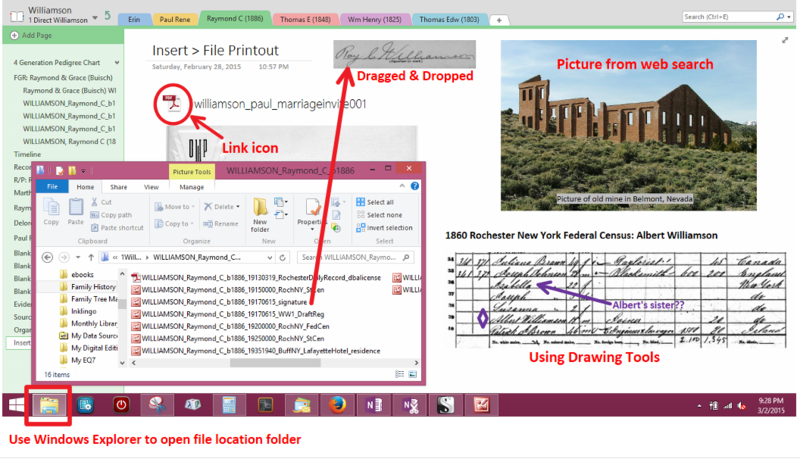 Erin Williamson Klein, “Inserting Files & Images in OneNote.” My Family History Files, 2 March 2015 (http://myfamilyhistoryfiles.com/organization/inserting-files-and-images-in-onenote : [access date]). But, you know, I keep trying and I have learned a thing or two during all my failed attempts at staying on task and being organized. Namely, why I fail at them. Why do I fail? Because I am a bit of a non-conformist, slightly rebellious and a procrastinator. Oh, and I rarely feel guilty about chasing down bright shiny objects [BSO] that come into view or new ideas (mostly for quilts) that pop into my head that I immediately set off to do—which I suppose is the quilting equivalent to a genealogy BSO. There it is. The plain truth. So what’s all this about Task Management doing on a family history blog? Welp, the funny thing about research is that it’s a whole heck of a lot easier with a plan. A clear goal. And a To Do List on how best to reach that goal. Another thing about family history research is that it helps immensely if you stay organized. So you’re not scratching your head later, thinking “Now just where did I find that tidbit of info?” or “Where did I put that death certificate for Grandpa Joe?” Add to that some motivation to stay on task when a bright shiny object comes into view and you can see where some form of task management is needed if I want to do this thing properly. And maybe a few forms. 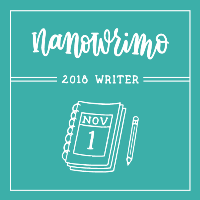 Like a To Do List and a Research Log. And, (what the heck?) it’s a topic in Week 4 of the Genealogy Do-Over! Oh, dear. It appears it is time, once again, to do something about my propensity to spend my days chasing BSOs in one form or another. Okie doke. I can do this. (I’ve done it before. Numerous times. LOL) So I dragged out a saved copy of this article on the Get Things Done system, finished reading this book on my Kindle and watched Thomas MacEntee’s Project Management webinar. And then I kinda mashed them all up and came up with my own Task Management System in OneNote. (You knew I was going to work it all out in OneNote, right?) It also helped that I had already started my long, long Master List for Getting Things Done back last summer. Another fail: See where it says Top Ten? It’s supposed to be a chart with the top ten things I want / need to get done. I have FIFTEEN things on my chart. [sigh] For the most part, my new plan is working though. Don’t get me wrong—I still chase down bright shiny objects in my research, or sit with my Kindle and finish off a book in a day, or waste time planning a new quilt that will probably never come to fruition—but I can easily get back on task because I can see what I SHOULD be doing and the steps to getting it done are laid out there for me in my Projects Section. And I can look at my list of completed tasks there in my Top Ten Section and see everything I have gotten done since I started keeping track last month. That makes me smile. By the way, this is my motivation for staying on task for the Genealogy Do-Over: If I’m going to do family history research, I ought to make an effort to do it properly and also make an effort to leave something that others can easily follow. Something that will show them how I came to my conclusions. Something with a strong foundation for them to build on. Now moving on to that urgent item [highlighted in red] on my Top Ten List… Oh, and be thankful I spared you the details to all the ‘reminder-type’ and ‘get-things-done’ apps for my phone that I’ve checked into. And then checked out of. 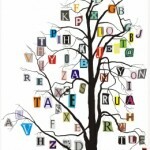 Erin Williamson Klein, “Task Management?.” My Family History Files, 24 February 2015 (http://myfamilyhistoryfiles.com/organization/task-management/ : [access date]). I have progressed beyond Week 2 of the Genealogy Do-Over. Well, actually I haven’t progressed much beyond Week 2. I seem to be working on parts of Weeks 3-5 all at once. I got stalled on the Research Log (said in that whiney, dramatic way a child would) which is kinda crucial to moving on. I haven’t posted about what I did for the Week 2 Topics so this is a recap of what I have accomplished for the Genealogy Do-Over Weeks 2 through 5. One of my research goals has been to start a new proofed tree with proper source citations starting with my paternal line. I am going back through the direct line and will come down the line chasing after the collateral lines. 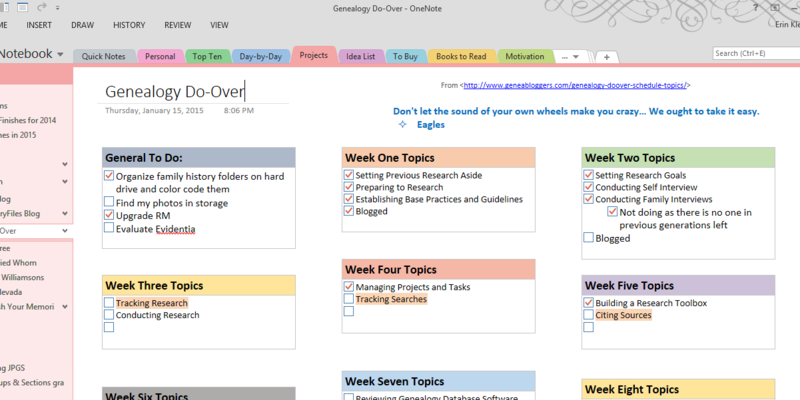 As I do this, I want to organize everything in OneNote, citing sources, using a Research Log with a To-Do List. Establish some good genealogy habits. I don’t plan to conduct any family interviews as (sadly) there isn’t anyone left to interview. I may try to contact my first cousins or their families from my uncle’s line at some point in the future. My uncle told me at one time that one of his grandchildren was interested in family history. For self interview I did a MS Word timeline. (I deleted the year of the events so I can still lie about my age.) My timeline gave me a to-do list of things to prove which had me hunting down documents to scan for future use in the Do-Over process. The task management system came together better than I thought. Posting about that next. (Don’t you hate those teasers?) Really, though, I wrote that post before this one and it’s scheduled to post tomorrow. Building a research toolbox / toolkit is something I had already been doing in OneNote. I took the time to rearrange the sections in my main Genealogy Notebook to organize it a bit more and added some of the resources that have been mentioned through the Genealogy Do-Over. The three things that have me stalled are interrelated. I am trying to round up and coral my thoughts and ideas on how best to accomplish keeping a research log with recorded searches and something that will make source citation easier all rolled into one. I have gotten better in the last year in keeping track of information for source citation, but tracking research and searches I have not been doing. I need to. Thomas MacEntee has generously shared his Excel Research Log with Do-Over participants and there have been others who have uploaded their modified versions on the Facebook group. I’m not afraid of tables nor using Excel, but none of them were really clicking for me. No thoughts of “Oh, I could do this to modify it for my use”. Not even a glimmer of a thought. Which kinda meant I had to invent my own forms. And I really want to keep it all in OneNote. So I have been pondering. And pondering. And then avoiding. I finally decided I needed to get this done—this week—if I want to move on with the Do-Over. Funny how when you DECIDE something should be DONE, inspiration will strike. I like deadlines because inspiration usually strikes right before I have to get something done. (It has to, because I have usually procrastinated right up until the deadline. LOL) But self-imposed tasks−like those in the Do-Over where no one is going to care if I do them−they can languish until I DECIDE they should be done or abandon them completely. Two nights ago inspiration finally struck! The problem with those other research logs was that they didn’t leave the trail of breadcrumbs I want someone else to easily see and follow. There was nothing wrong with them, it was just me and my process that didn’t fit their mold. So then it was time to turn it around. How would a research log work in my process to leave a trail of easy-to-see-and-follow breadcrumbs? And that’s where I am at. Working on that form. 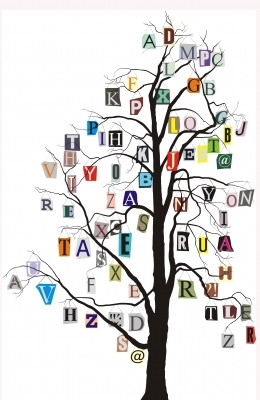 Erin Williamson Klein, “Genealogy Do-Over update.” My Family History Files, 23 February 2015 (http://myfamilyhistoryfiles.com/organization/genealogy-do-over-update/ : [access date]).